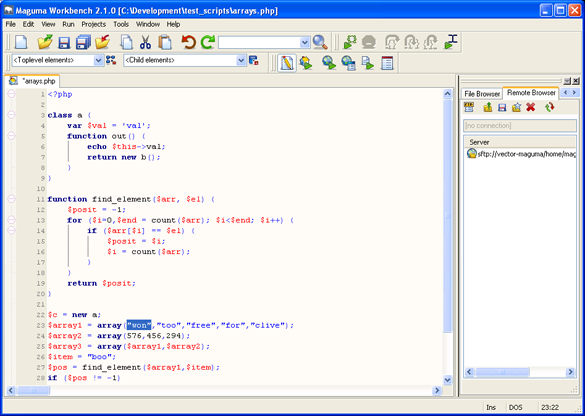 Maguma Workbench was Maguma's flagship IDE. Maguma Workbench went beyond a typical PHP IDE. Maguma Workbench incorporated a modular plug-in architecture, keeping the core product small and fast, while providing maximum flexibility and features. Maguma s integrated tools allowed for the automation of many common tasks in Web development thus speeding up the process. The integration of common applications like CVS and SFTP reduced the need for external programs. Features like built-in debugging and a regular expression helper provided quick ways to accomplish necessary tasks all while in the Workbench environment.